Strategic supply management impacts every aspect of healthcare. When designed properly, comprehensive healthcare storage solutions help hospitals and other healthcare facilities improve patient care, control costs, and save space. If you need a way to keep your sterile supplies and surgical kits organized and readily accessible, while still allowing for easy cleaning, LEVPRO suspended shelving can help. By suspending shelves on an overhead track, the aisles of the LEVPRO system compact to greatly increase the capacity of your sterile storage room without expanding the footprint of your space – and without a major construction project. Plus, you can access multiple aisles at a time for quick picking, and the suspended shelves make cleaning under the system a breeze! Nurses spend on average of 21 minutes per shift searching for lost equipment and supplies. Sterile surgical kits at an Illinois hospital are organized on a high-density mobile system. Onsite evidence lockers store biological evidence until police can retrieve it. Suspended compact shelving keeps sterile supplies organized and accessible while maximizing the capacity of your space. In-room nurse servers store items at point of need. Locking cabinets integrate with electronic supply management system to save hospital 40,000 a year. An estimated $4,000 of equipment per bed is lost or stolen in the average U.S. hospital annually. A 300-bed hospital could be losing $1.2 million of equipment each year. Accessible, well-organized healthcare storage solutions boost morale by reducing frustration and minimizing physical strain, allowing staff to devote their attention to patient care. Reduce frustration associated with looking for lost item. Store items at point of need. 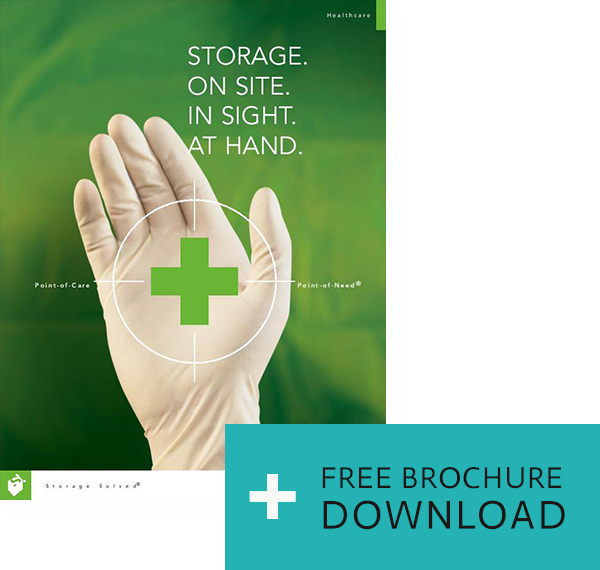 Every square foot of a healthcare facility that’s used for storage is a square foot that can’t be used for patient care. But because proper storage is vital to optimizing assets and promoting patient health, it makes sense to maximize space with compact storage. High-density mobile storage systems eliminate wasted aisle space in supply rooms and other areas. Maximize vertical space with configurable shelving, modular bins, and steel pegboard. Suspended compact shelving in your sterile storage room makes for quick picking and easy cleaning. An Ohio hospital optimizes space with modular bins and compact shelving. Eliminate wasted aisle space with high-density mobile storage systems. Boost efficiency and minimize patient disruption with in-room nurse servers. Reduce hunting time while maintaining a sterile environment with our rail-less shelving system. Modular bin storage keeps supplies organized and accessible. Steel pegboard provides sturdy storage for bins and hanging items. Evidence lockers provide secure storage for biological evidence. Double-sided and single-sided carts provide flexible storage options. Fast response lockers provide secure weapon storage in a nondescript locking cabinet. 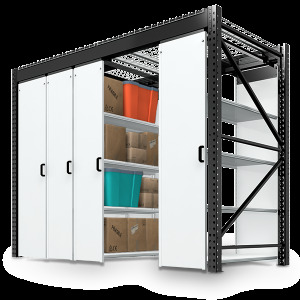 Spacesaver and its network of local consultants can help design, build, install, and maintain flexible storage systems that integrate with existing equipment while saving space and providing room to grow. Our projects are engineered and manufactured in Fort Atkinson, Wisconsin, the same small town where Spacesaver was founded more than 45 years ago.